In English / French with English subtitles. "AwA'ahdah", "iishuh", "ilah qe'xleh" ... Words from the end of the world, forgotten, that have almost lost any meaning, even to their people. In Alaska, the Eyak language "died" in 2008 when the last speaker, Marie Smith Jones, passed away. But is there life after death? The Eyak people believe so. Marie had a dream before she died. She said someone will come from far away to help them. Two years later, Guillaume Leduey, a 21-year-old Frenchman, set foot in Alaska, on the lands of the people whose language he had learned by himself, alone, in France. A language that vanishes is a part of humanity that goes away. A price the Eyaks are not ready to pay and a threat not to underestimate. Is this a lost battle? Isn't evolution a natural process? Is it possible to still speak a indigenous language in a country where English is well established as the official language? 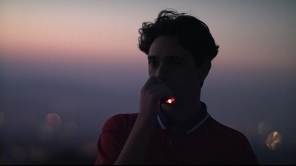 But above all, how did a young Frenchman became, in a few years, the best hope for a people in quest of his identity? These are the many issues I tried to address in this documentary. To do so, I gave voice to the people concerned, the ones who decided to fight in order to save the Eyak language and their traditions. I immersed myself into their fights and their fears in order to have a better understanding of the issues they are facing. Beyond the desappearance of a language, culture and tradition fade away, leading indigenous people to become withdrawn. Guillaume is a triggering factor in resurrecting the language, but he is also the starting point of a new page of Eyak history. A history I am trying to explore and narrate in this film, even though it is just at its beginnings. 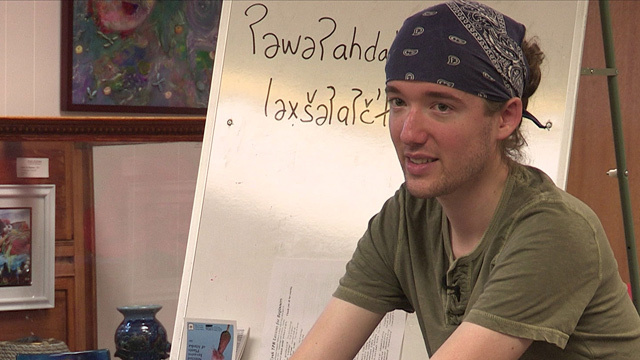 When Guillaume started to learn the Eyak language, he had no idea how important this decision would become. The first time I got on a plane to meet with him in Alaska, I could not imagine how big this project would turn to be. I spent six years of my life filming this incredible story, I took many trips to Alaska, making thousands of miles by plane, car, ferry and even kayak! Their battles became also mine, year after year, I was there, even trying to learn a few words of Eyak. With or whithout my camera, I shared these moments between laughs, tears and hard working times. People you will see in this film have become, for some of them, my friends, my family from the other end of the world and thanks to that bond, I had a better understanding of what they were going through. This film had to exist, this story needed to be told before it was too late, before the words were to remain... on the tip of their tongue. Themes: Language, Indigenous, World Cinema, Writer.